Free Summer literacy program for at-risk children. Pre- and post- assessments to measure results. Success is due to 50% instruction 50% relationship. ENHE works with the whole family! ENHE starts young before the Achievement Gap gets too big. Because every summer low-income children lose 3 months of reading skills, this is called the “summer slide”. Children get free breakfast and lunch every day of the summer program. The monthly workshops during the school year build a community around literacy. Children love doing cheers and chants every day during the summer! Arts and Humanities projects help children create meaning in the world. Children get a book to take home every day of programming. Parents learn tools to help their children comprehend what they read. Currently 79% of the children at the schools ENHE targets are not proficient in reading. Reading is the foundation for all learning! Every career requires you learn to read well. Children learn about Nashville in their weekly field trip! Daily Guest Readers are great role models. ENHE is a place where we exchange ideas, giving each other hope. Children get to have waterplay once a week in the summer! Because a literate future is a future worth participating in. Literacy opens doors in life! Strong foundation in language leads to more meaningful personal and business relationships. Helping children read is the most meaningful way I can give back to my community. Reading proficiency shouldn't be determined by race or economic class. Workshops include Search Institute’s research - proven 40 Developmental Assets. Teachers are certified and use best practices in literacy. During the summer program, students get at least 250 minutes of concentrated literacy a day! Right now only 79% of the students at ENHE’s target schools are proficient in Reading/Language Arts. ENHE uses a special formula: 50% instruction, 50% relationship when doing it’s work. Literacy is all about the 3Rs: read, read, and read. Children make new friends during the program! Families make new friends during workshops and learn from each other. Children from low-income families have a 30 million word gap by the time they turn age 3. MNPS can’t do it all - the district needs strong partners in the community. In the most prosperous country in the world, many of our children are not learning to read well. ENHE helps single parents: in 2015, 73% of ENHE’s children were from single-parent households. ENHE’s theme, ‘My Family, My Community, My World,’ helps children to take ownership of their place in the world. Family literacy workshops happen once a week in the summer and once a month during the school year. Our children are not learning to read and we CANNOT be okay with this! ENHE’s mission is to strengthen literacy of at-risk children in East Nashville. ENHE is passionately committed to delivering high quality programming. The average child growing up in a low-income family has only been exposed to 25 hours of one-on-one reading. 82% of America’s fourth graders who are reading below-grade level are from low-income households. Among those who reach adulthood with the lowest level of literacy proficiency, 43% live in poverty. Among those who have strong literacy skills, only 4% live in poverty. Children must learn to read before they can read to learn. ENHE offers low-income children a 6 week literacy program for only a $30 registration fee. Classrooms have two teachers and only 15 students. ENHE makes family engagement a priority because the parent is the #1 teacher. More than 1 in 3 children arrive in kindergarten w/o the skills necessary for lifetime learning. Those who are not reading well by third grade are 4 times more likely to drop out of school. We live in a ‘post-segregation’ era yet one school on Woodland ave is 83% white and 78% are proficient in reading/language art; at the other end of the street, and another school 1 mile down the road is 83% black and only 14% are proficient in reading/language arts. ENHE serves K-4th grades, when building literacy is building a foundation for the rest of a child’s life. 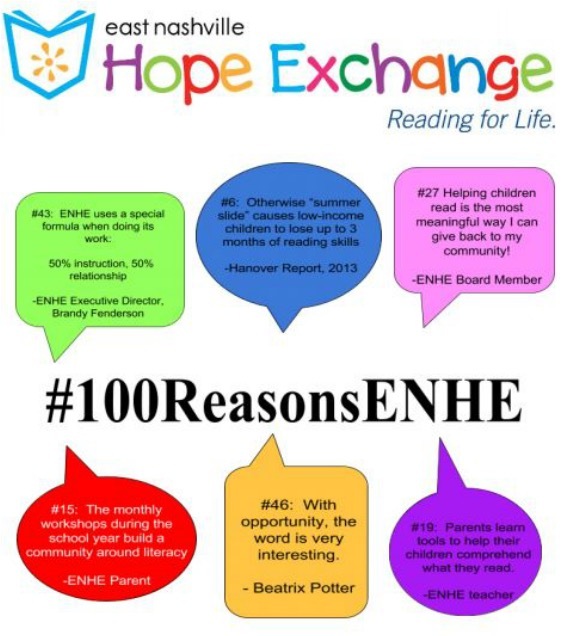 ENHE’s goal is to serve 100 children in 2016. ENHE serves low-income families: in 2015 97% of ENHE’s children were from low-income families. A typical ENHE summer program day includes at least 250 minutes of literacy. ENHE students enjoy the Wishing Chair Productions puppet show and a Nashville Ballet performance every summer. ENHE is passionately committed to building relationships with children, families, teachers and the community. ENHE is passionately committed to championing a life of success for all children.